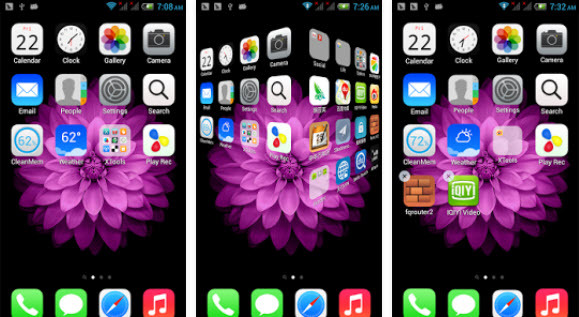 Personalization: how to transform your Android smartphone into an iPhone? If you have a smartphone running Android, you have a device with a very open operating system where almost anything crazy is allowed. Despite everything, you may have a penchant for the iPhone's elegant interface, its simple and colorful icons and its own ergonomics. And rather than giving up 800€ to buy one, it is possible, by browsing a little on Google Play, to find applications that easily create an illusion. Logitheque has identified them for you and offers them in the article below. First of all, it is important to know that when you type "iOS" in Google Play, you come across a multitude of diverse and varied applications. These promise to offer you the experience that is closest to the original but are often full of ads or limited features. Sometimes they even do not work at all. After trying some of it, we came across the publisher who, in our opinion, is the closest to perfection. That's why we recommend the apps of the Espier team. Espier actually offers a large list of applications that can be added to each other. As Espier applications are now a few years old, we will also offer you other alternatives available on Google Play. Their disadvantage is that they often offer advertising that degrades the user experience. 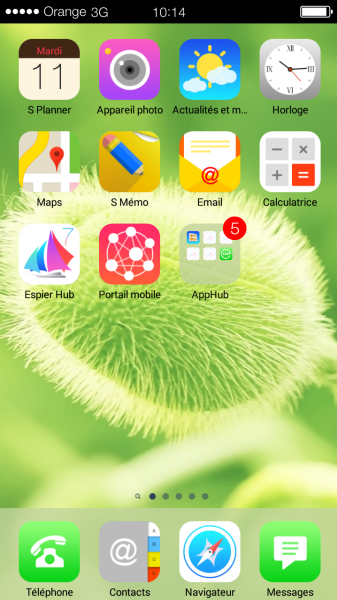 Espier Launcher 7 is an application launcher and the heart of the customization of your Android smartphone. Indeed, all the applications that will be presented later on will require this launcher. In practical terms, it allows you to have the same interface as an iPhone. You will therefore have several pages with all your applications and the ability to create folders. You can also manage the icons by giving them a particular color. The result is convincing with a good fluidity of application. Transitions between different pages are fast, as is switching between an application and your home page. Now that it's good for the interface, it's time to take an interest in the lock screen. To do this, you must go through Espier Screen Locker 7. 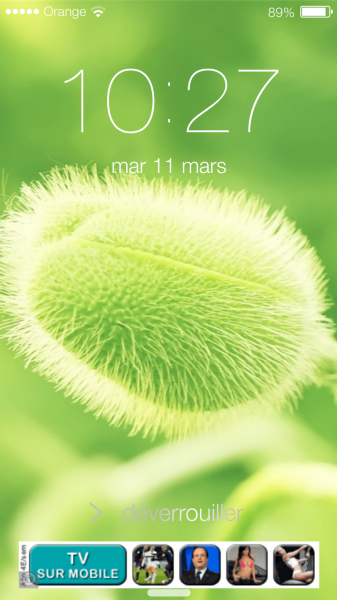 This application allows you to dress up your smartphone with a lock screen that is very faithful to the iPhone. It works on the same principle as a traditional screensaver, you just need to slide your finger to access the home screen. You can also integrate the request for a password to secure your smartphone. The camera is accessible directly via a button. Espier Control Center 7 allows you to display a control panel similar to that of iOS 7. Thanks to it, you will be able to manage the connections of your device: WiFi network, mobile data, Bluetooth but also control your music player, manage the brightness, turn on the flashlight. Just like on the iPhone, you can access it by sliding your finger up and down. 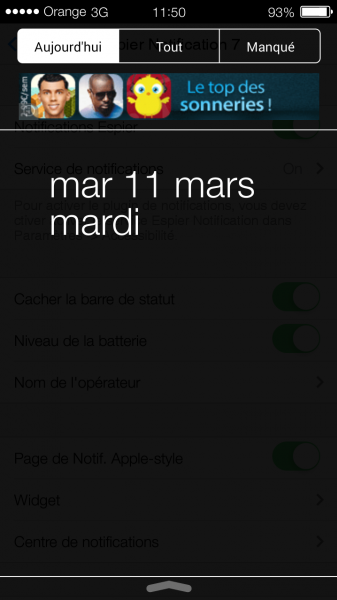 Espier Notifications 7 adds the Ios 7 notification center, which you can access by sliding your finger up and down. This will give you access to missed calls or reminders. This application also manages the display of notifications on your unlocking screen. You can select the applications that interest you and they will be displayed as soon as a notification arrives. To go further, Espier has also developed two applications that can replace your directory and SMS manager. First of all, Espier Dialer 7 offers an interface similar to the iOS dialing application. You will find the same round keyboard as the iPhone and a contact manager. 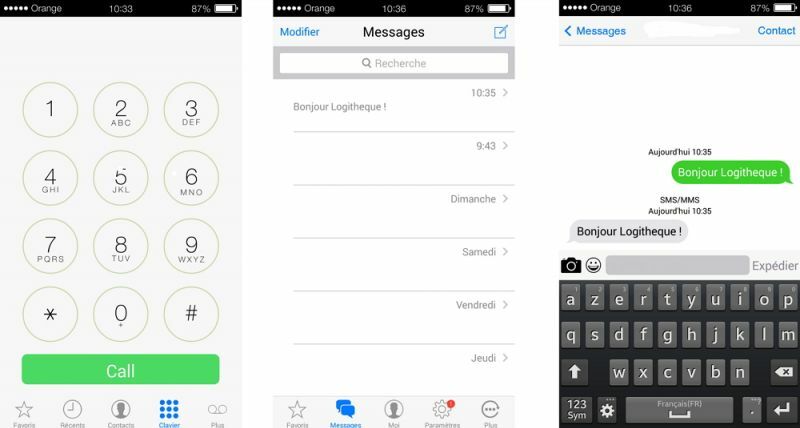 For an SMS application like on the iPhone, there is Espier Messages 7, which offers a very simple interface and colorful bubbles in conversations. It even integrates its own Internet SMS service, although it also manages traditional SMS messages. In short, with all these applications, you can end up with a phone that really looks like an iPhone. Espier applications all work with each other since they are designed by the same developer. This makes it easy to switch between the different features offered. Another significant advantage is that all these applications have a free version or most of the features are accessible, which, let's face it, is much cheaper than buying an iPhone. In their free version, advertisements will appear on your device. These are, for the most part, quite discreet except in the notification centre where they tend to be more conspicuous. Finally, the basic versions do not offer advanced features for those who want to customize their device from top to bottom. To obtain them, you must either go through the "payment" box or be an active user of their website to accumulate Espier Coins. Thus, it is possible to benefit from all their applications without having to pay a single cent. For those who want alternatives to the Espier editor applications, here are the ones we recommend. xOS Launcher is a launcher rather faithful to iOS. It replaces your home screen and brings icons and wallpapers inspired by Apple's operating system. 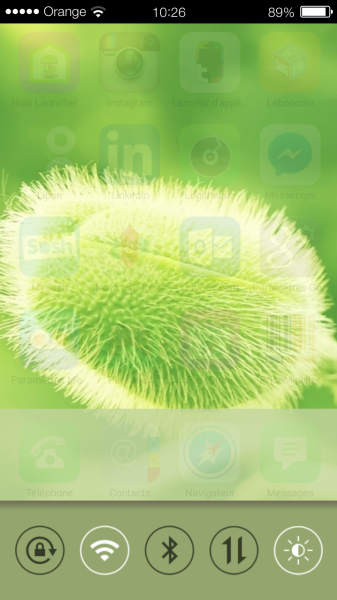 Despite everything, it is rather light even if it is possible to activate effects in the options to make it a little more pleasant to the eye.xOS Launcher allows you to classify your applications as you wish, for example, in folders. You can also place your favorite widgets in seconds. 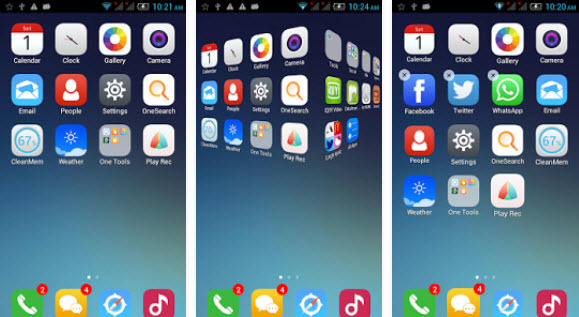 One Launcher is another very lightweight application launcher. 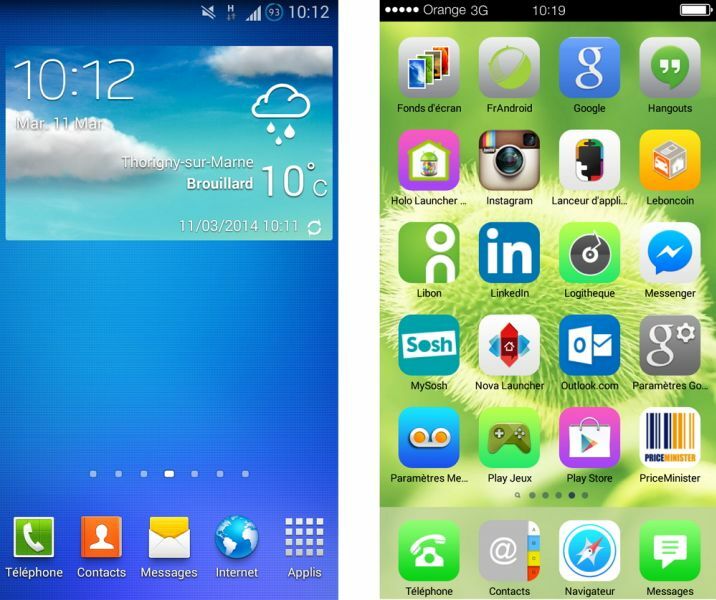 While it does not offer an icon pack similar to those of iOS, it still supports most of the packs you will find on Google Play and it adopts the same organization as iOS: a home screen with all your applications and no menu.However, One Launcher is rich in options and allows you to customize the interface as you wish. The Control Panel application allows you to have a control center inspired by that of iOS. It appears when you slide your finger from the bottom of the screen to the top and allows you to have quick access to several features of your phone: mobile data management, Wi-Fi or screen brightness.It is possible to add an additional line of shortcuts to make it easier for you to access your favorite services. 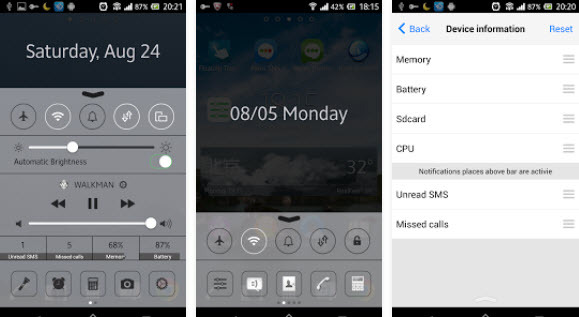 You can also enable or disable notifications of missed calls and pending messages. So if you want to give your Android device an iOS look, feel free to test some of the applications we recommend. Leave a comment for	the article Personalization: how to transform your Android smartphone into an iPhone?